I’ve never been much of a pickup fan, probably because I’ve never had the need for one. I can however admit when one looks really cool. And the Ridgeline Black Edition really caught my eye under the lights of the Buffalo Niagara Convention Center. 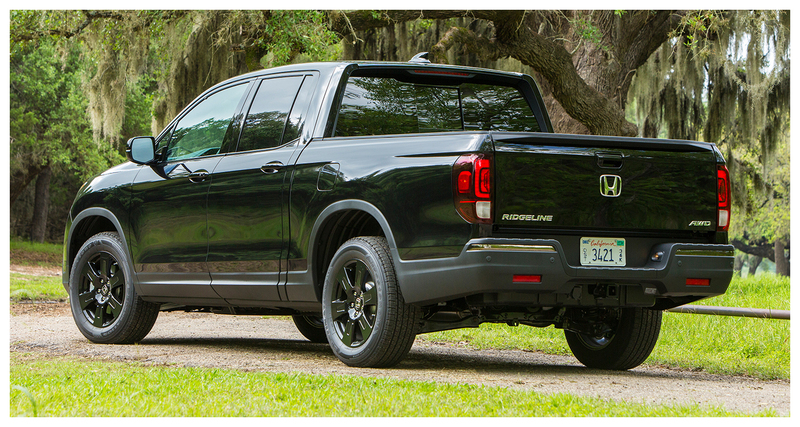 The deep black monochromatic paint combined with what Honda calls 18-inch Exclusive Black-Painted Alloy Wheels gives the built-in-the-USA (in Alabama) Japanese pickup a much more sinister look than say, the standard RT front-wheel-drive version, which for some cheap reason is available in only two colors — boring silver and boring dark gray, which I guess is all you get with a starting price of $29,730. 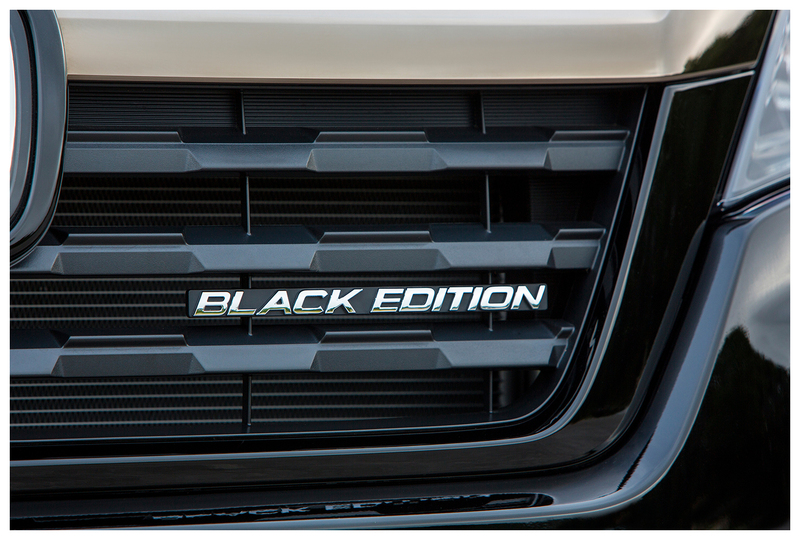 Also included in the BE, adding to the look, are gloss black-painted grille and window trim. The BE, which admittedly has only one color choice, starts at a hefty $43,220. But with that price you get a boatload of extras. One of the bigger features standard on the BE is Honda’s AWD system, which these days just seems right on a large pickup. Especially considering that the alternative in other Ridgelines is front-wheel-drive, which IMO just doesn’t fit the stereotype. 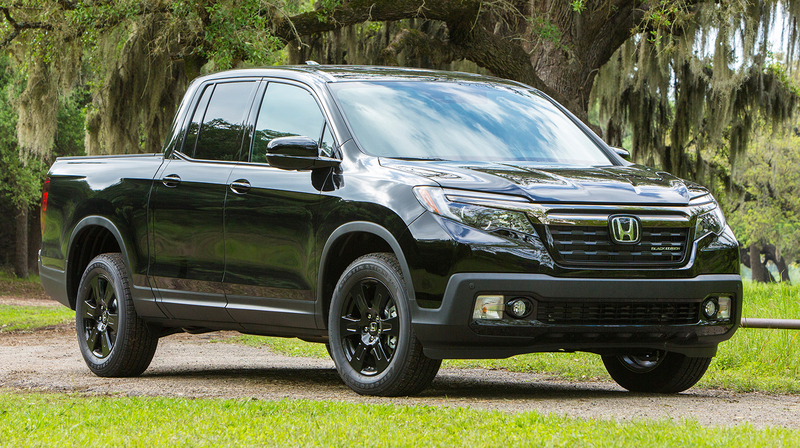 Under the hood of the BE (and all other Ridgelines) is a 3.5L V6, connected to a six-speed automatic transmission. Open the doors and find a sumptuous interior featuring black perforated leather with a red under-fabric and red stitching. Red LED lighting accents the footwells, door pulls, and center front beverage holders, while the audio touch screen is illuminated with red back-lighting. Also standard on the BE are Honda’s satellite-linked Garmin®-based nav system (with free map updates for five years; HD digital traffic; lane guidance split-screen for road signs and exits, and voice recognition); Honda Sensing (collision mitigation braking system, road departure mitigation, adaptive cruise control, and lane-keeping assist); power moonroof; power sliding rear window; 150-watt/400-watt truck-bed power outlet; heated steering wheel; heated front seats… and of course, on-and-on. 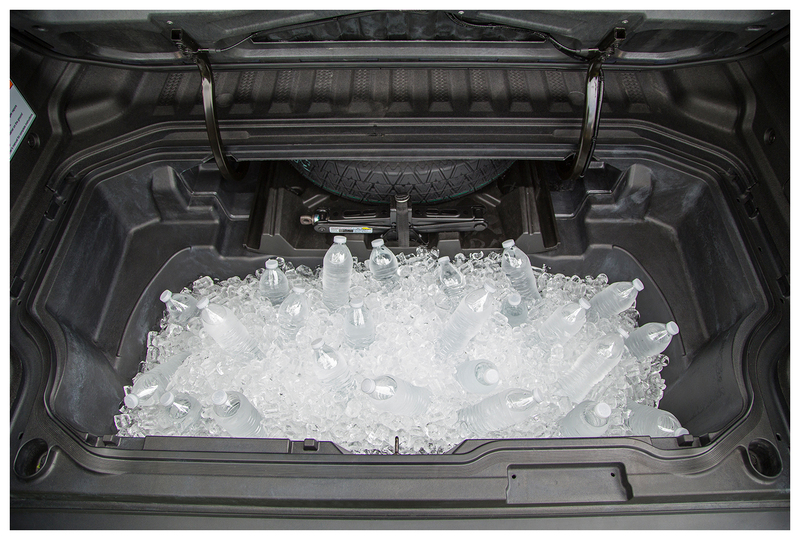 One neat thing about the Ridgeline is its clever lockable 7.3 cu.ft. trunk under the bed floor, with a drain plug which enables you to hose it out. 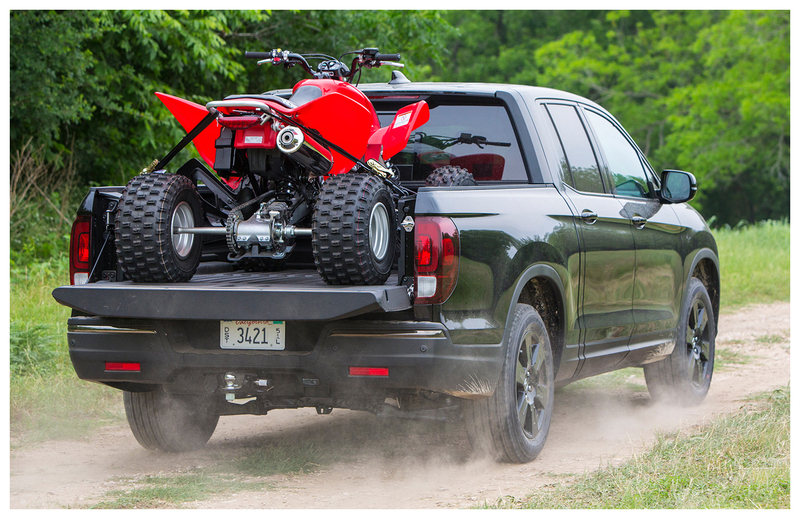 Also, the tailgate opens either down or to the side, making it easier to get some heavier things in and out. The bed is over four-feet wide, and the wheelwells don’t intrude, which means you can lay those sheets of plywood flat (although they’ll be hanging out the back). 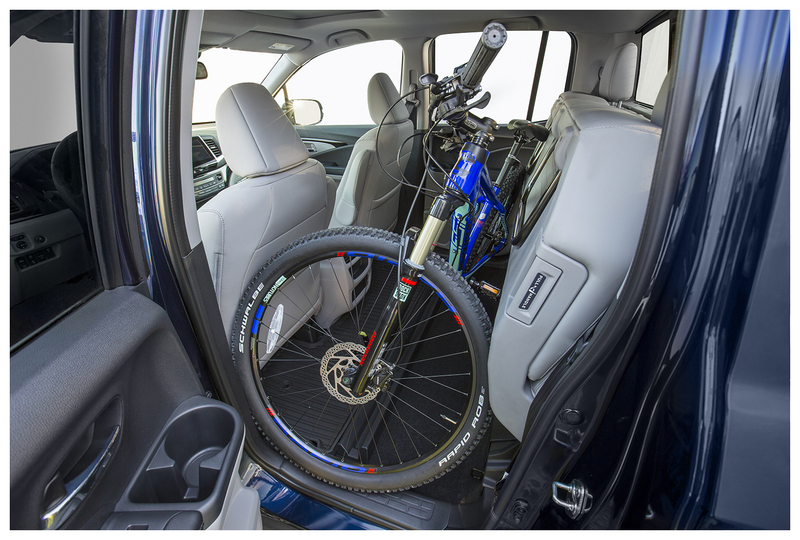 And as you can see in one of the accompanying photos, with a little careful planning you can get a bicycle into the rear seat area, keeping it locked up and safe while you enjoy your Buffalo Slow Roll after-party this summer! 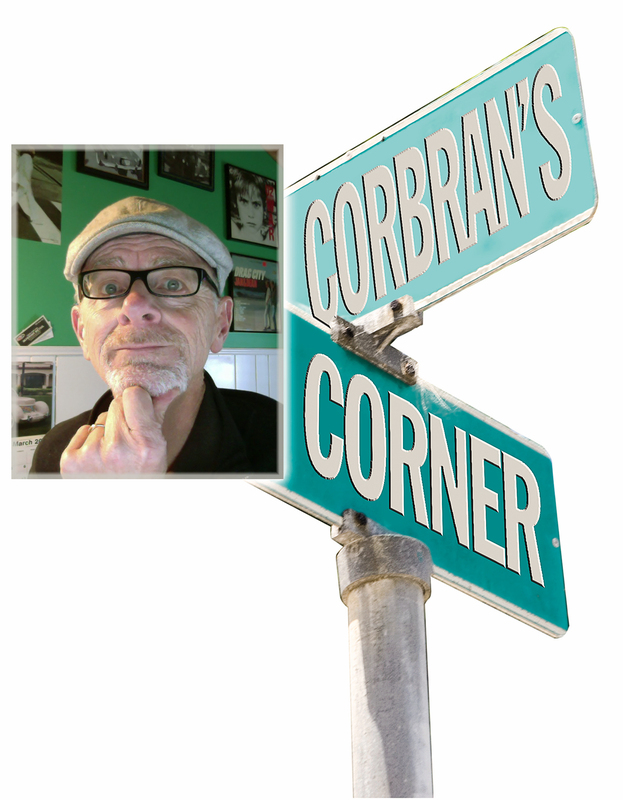 So to sum up… yes, it’s pricey (but most big pickups these days are — some much more so); it’s very attractive; and you won’t see one in seemingly every second driveway on your block. It’s well worth a look if you don’t need a real heavy duty pickup.